In 2019 the Peoples Bank Theatre is celebrating its 100th anniversary in style, kicking off with a bona fide ride back in time on Saturday, February 2 starting at 8 p.m. with their 1919 Speakeasy Party. No, there won’t be a literal time machine – but for those pure of intention and heart, dressing up in their finest vintage gear, enjoying an equally vintage cocktail and perhaps a few dance moves to the Dixie Stompers ought to summon up feelings of heading back to the earlier part of the 20th Century. The event is a fundraiser for the Peoples Bank Theatre, which has gone by many names since its initial construction in 1919. Drew Tanner, the Marketing Director for the Peoples Bank Theatre, said that when the institution first opened, it was as the “New Hippodrome,” as it had been constructed to replace a theater located around the corner from the current theater that had burned to the ground on Thanksgiving of 1917. Within about a year, the New Hippodrome was up and running, featuring theater, live music, silent film showings, vaudeville shows, and more. “The theater was really built in a real sweet spot for theater architecture, right before motion pictures took hold; so it was built with a vaudeville era size stage – if it had been built just a few years later it would have had a much smaller stage and it would have been built primarily as a movie house. Instead we have a 30-by-50-foot stage,” he said. On the inaugural opening of the theater in May 1919 featured a screening of Daddy Long Legs, a feature film starring actress Mary Pickford, for whom the Mary Pickford cocktail that will be served at the 1919 Speakeasy Party is named for. The drink is made up of white rum, fresh pineapple juice, grenadine, and Maraschino liqeur and typically served with a pineapple slice or maraschino cherry. Supposedly the drink was personally crafted for Pickford in the ‘20s by a bartender at the Hotel Nacional de Cuba in Havana when she was vacationing there with her husband Douglas Fairbanks and his best pal, the one and only Charlie Chaplin. The other special Prohibition-era cocktails that will be available for purchase throughout the party are the Gin Rickey (lime juice, seltzer, gin, and sugar) and the Bee’s Knees: a gin-based drink to which honey and lemon were added as to diminish the assertive tone of homemade liquor being served at speakeasies. 1919 marked the passage of the Volstead Act, which carried out the 18th amendment, criminalizing the sale, production, and transport of “intoxicating liquors” in the United States. This led to a direct boom in criminal alcohol creation and sales, which by 1933 was so out of control that the act was repealed. A while after the end of the prohibition of alcohol in the United States, in the ’40s, the New Hippodrome was purchased by Shea Cinemas, a company based out of Buffalo, New York. There was a re-naming contest held for the theater, which was christened The Colony as a result. The Colony was primarily a movie theater until it shuttered its doors in 1985. In 2016, the Peoples Bank Theatre reopened as we know it today. 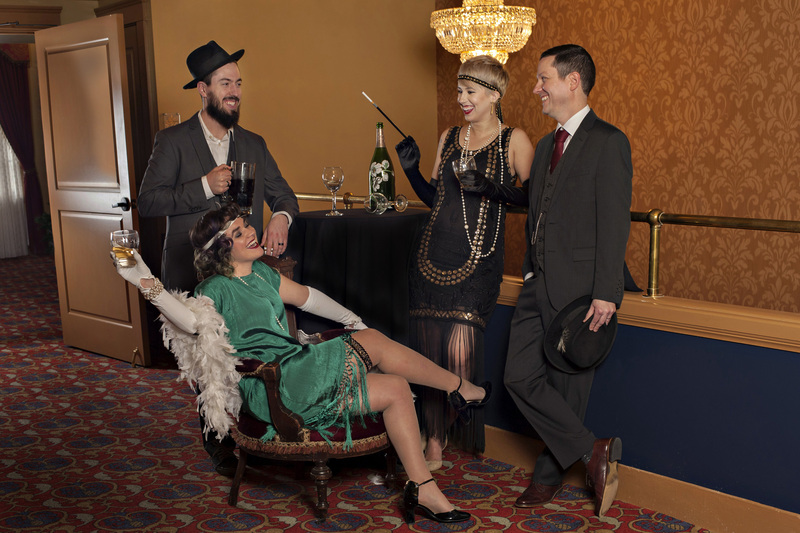 The 1919 Speakeasy Party is just the first of several events that the theater is holding a a part of their 100 Days for 100 Years celebration, which includes a number of events that you can find details on here. All tickets to the 1919 Speakeasy Party are $50, and the event is 21 and older only. Ticket includes commemorative glass, house drinks, and food by Da Vinci’s.